Sweet Silver Lining: Notes on Nursing: Meet Lauren! Notes on Nursing: Meet Lauren! Meet Lauren from Life. Love. Lauren! I went to school at New Mexico State University where I got my Bachelor of Science in Nursing. I graduated Dec of 2011 and then joined my husband in Arizona where I searched a while for a job. I finally found one in Skilled Nursing and now I am currently doing agency but always still searching for my dream job. I graduated in Dec 2011 but didn't take my NCLEX until April and then didn't get a job till August of 2012. So I have had almost a year of experience. What was the toughest part about going from nursing student to nurse? Finding a job. I could have had a job had I stayed in New Mexico and it has definitely crossed my mind that maybe I should have done that. But I moved to Arizona where finding a job was not easy. Back when the nursing shortage happened in the mid 2000s, nursing schools were asked to increase their class sizes. Arizona and Maryland were the two states that increased their class sizes the most and therefore it is hard to find a nursing job in this state. My dream would be to work in a hospital. I don't have any specific areas I wanna work in, I just wanna work. What area of nursing do you work in & what are some responsibilities unique to your job? Currently I am working agency nursing which is basically like a substitute teacher for nurses. I come in when companies need a shift covered. I like that I get to do something new everyday, but the inconsistency of work does kinda stink. I am getting valuable experience though! What is your favorite part of being a nurse? Least favorite? My favorite part is the feeling of helping people in a way that most people cannot help. I see patients at their most vulnerable and sure there are many more days where I am pooped on versus not, but the second that I see a patient smile because they are feeling better, it makes my job worth it. My least favorite aspect of the job in general is that I can't find the perfect job I want, but I am willing to wait. And sure working holidays and the pay isn't stellar, but the positives SOOO outweigh the negatives!!! What made you want to be a nurse? When my sister was 5 she was diagnosed with Acute Lymphoblastic Leukemia (ALL) I saw her doctors and nurses dedicate themselves to her when we most needed someone to help us. There were times that she would go to surgery or we just couldn't be in the room and it comforted us to know that there would be people in there to hold her hand and genuinely be there and help her as much as possible. I want to be that someone for the patient and their family members. What was your experience with nursing school & the NCLEX like? I worked a lot during college to ensure I did not come out with debt. This made for some less than stellar test grades some mornings, but overall I did well and enjoyed nursing school. There were a lot of great people in my cohort that made it an even better experience. The NCLEX I did not like, not one single bit. I think that is a cruel cruel act of torture...haha. Favorite nursing skill to perform? I like PEG and dobbhoff tubes. For some odd reason those are probably my favorite. Any advice for nursing students or new grads? Be persistent and patient in finding your perfect job. Use connections, learn to speak up, and don't be afraid to ask for help. We are all human. For me, personally, I've been able to relate to Lauren the most. It's so frustrating searching for a job. Everyone says there's a nursing shortage, and there is, but most jobs are looking for experienced RN's. You can't become an experienced RN if no one is willing to give the new grad RN's experience in the first place. It's good to know that something will open up eventually; I just have to stick with it. Thanks so much, Lauren & I hope we both find our dream hospital jobs soon! If you want to be a part of Notes on Nursing, leave a comment below or e-mail me at friebr01@luther.edu. Hello! New follower here! 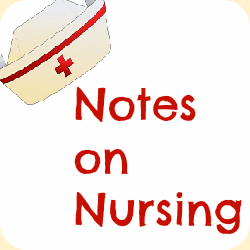 Found you through peace love and sequins and I'm loving your notes on nursing series! =) keep up the good work ladies!